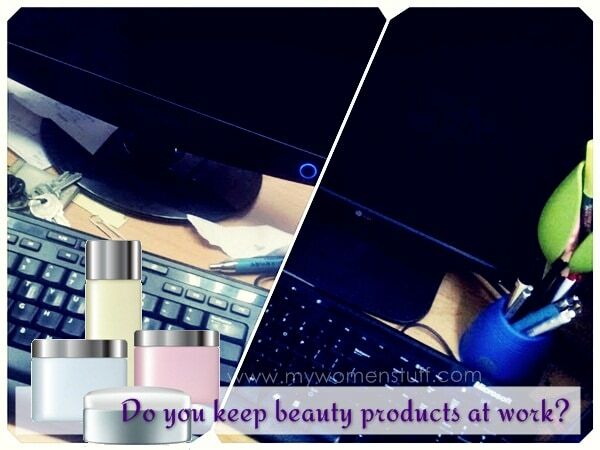 Home » Interesting Discussions » Your Say: Do you keep beauty products at work? What do you have on hand? Your Say: Do you keep beauty products at work? What do you have on hand? Which brings us to an interesting question some friends have asked me – What beauty products do you keep at work? What do you ensure you always have on hand, even at the office? I’m serious! I don’t keep any beauty products at work. No makeup, no hand creams, no lip balm. That’s my work desk in the office and at home up there. They are messy as anything, but its mostly scraps of paper, stationery and at work, some chocolate (not even sure why since I don’t eat much chocolate either!) But not a beauty product to be seen. I guess its because I don’t use hand creams, nor do I use lipbalms, the 2 items you may expect to find at most womens’ desks. I really should, seeing that constant exposure to air-conditioning can be very drying to the skin. Maybe I’ll bring a tube of hand cream to work the next time. Your say: Do you keep beauty products at work? What beauty products do you have on your work desk then? PREVIOUS POST: Get a Royal New Look with Dior Royal Kaki 454 Eyeshadow palette : My favourite of the New Look palettes! NEXT POST: A very pretty Guerlain Meteorites Pressed Powder Compact : Does it live up to its Illuminating and Mattifying claims? I keep hand creams around because I keep getting paper cuts, and um, for when I’m bored. I’ve never had a “real” office/desk with drawers, so I can’t say what I’d do (and well… they’re all beauty internships). I was going to say no I don’t because i always have it in my purse and then I looked at my desk…moisturizer, lipstick and blush and clear polish! lol… not for my nails… in case of a run in my stockings. Heh, at my desk I keep hand lotion, antibiotic cream, and hand sanitizer. Wow sounds like you’re well prepared for all eventualities! 😀 In my makeup pouch in my bag, you will only find lipsticks LOL! Ah so you have a mobile office! I never got the hang of carrying a laptop around so I ditched mine. Very liberating not to own a laptop hehe… But yes, the backpack & laptop etc is terrible for the back. Hand sanitizer! Now that you mention it I guess I’m lucky no one else touches my stationery except me 😛 In a previous office, I had a whole set of toiletries and skincare at the office because I used to work late. As in overnight. These days, I don’t so that doesn’t happen anymore YAY! You are definitely not the odd one =) Although I haven’t start working, but I seldom pay any attention the hand cream and lip balm as well. Guess this is one of the habit which I should change as my hand’s skin getting drier and drier nowadays. I only ever apply hand cream now before bed. Thats it, though its at least 1 time more than I used to LOL! I’m not working yet but I have a jar of tony moly peach hand cream sitting there in my desk. Thermal flask, dental floss, toothbrush and toothpaste. Recently added, dry shampoo to freshen up the hair. This is what I call minimalistic beauty! It’s okay, I can relate. I only have four products and mostly for eczema and itching, so I’m not sure if they actually count. And I’m gonna have to throw out that hair thing because it smells funky now. Oh i’m surprise. I have on my desk – hand cream, body lotion (which I hardly use) and face spray (which I hardly use). In my drawer – stash of makeups (I usually do my makeup in the office) and some lipbalms. oil blotting paper counts? And a spare lipstick for quick touch up. My colleague is all guys especially since I work in an aerospace industry and I get weird look if I pull out my lip balm. So not wanting to shock them even more, there’s goes my face spray and everything else. haha…Paris, good question 🙂 even I don’t keep anything on my desk and not even a lip balm…but, I always try to make sure I carry a cream with me in my bag and always forget to do it or use it…and, always remember it in emergencies when my hands get too dry or my lips feel stretched 😀 but, yes, I am too lazy still. but. right now, I do have a body lotion in my bag. kept it just yesterday as my hands were getting dry due to air-conditioning. Let’s see…I have 2 hand creams, 1 facial mist and most importantly, my Humidifier which I bought to constantly blow mist into my face as I work in the dry air conditioned office. It is just so so dry to live in a desert environment! I don’t have anything at my workplace as well. But at home, because my dresser is kind of small, my beauty products spill over to my writing desk, where I put my laptop. So currently, I have my Baby Lips, Eyelash curler, a Sleek Palette. Also a spray bottle of rose water and a Lush Hand cream. I have little drawers on the table with everything from blushes to eyeliners, and in one of the two drawers under my table, are eyeshadow palettes too. haha, the other drawer contains my proper stuff like receipts, bills, etc. Paris, you’re odd! Lol, Im kidding. Wow, but bravo to you to manage to keep your Beauty Monster under control at work. Mine is all out and proud 😀 on my desk at work you can find lip balm (sometimes even 2), hand cream, hand sanitizer, vitamin b5 cream for dry skin/lips, hair oil, leave-in conditioner for hair, hair scalp treatment (yes, try to grow out my hair), oil blotting papers, spa water spray (useless), in the summer there is also a sunscreen or uv powder.. And no, I dont have a problem.